Lindsey Grooters jumped up and down yesterday on the pier at North Island Naval Air Station, scanning the tiny, white-suited figures standing along the rail of the aircraft carrier Nimitz. Then she spotted him: Petty Officer 3rd Class Justin Grooters, the newly minted sailor she and her mother, Carolyn, had traveled from Phoenix to see off. “See you later, little brother!” she shouted, waving her arms as the ship glided away from its berth. The Grooters joined hundreds of well-wishers before dawn at North Island. A similar group gathered at San Diego Naval Base at 32nd Street, the departure site for the Nimitz's four support ships. Altogether, the vessels left on a deployment filled with more than the usual amount of uncertainty. The Nimitz strike group – which includes the cruiser Princeton and the destroyers Higgins, John Paul Jones and Pinckney from San Diego – is expected to replace the carrier Dwight D. Eisenhower in the Persian Gulf a few weeks from now. 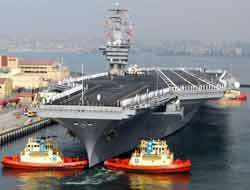 It will serve with the carrier John C. Stennis during a time of growing friction with Iran. The Nimitz strike group's commander, Rear Adm. Terry Blake, downplayed the risk. Still, some family members said they couldn't help feeling nervous. Iran is detaining 15 British sailors who were inspecting the cargo of merchant ships off the Iraqi coast, claiming the sailors strayed into Iran's waters. That's the same job some sailors on the destroyers will be doing. “It bothers me a lot. I can't even understand why he joined,” said Carol Hyniger. She traveled with her husband from Pontiac, Mich., to send off her son, Petty Officer 3rd Class William “Bobby” Grant, on his first deployment since he enlisted a year ago. Nearby, Meaghan Kinzle said it's extremely scary to have her husband of three weeks, Airman Justin Kinzle, deployed to a war zone. She has been a student in Tallahassee, Fla., and he has been stationed in San Diego, so separation is nothing new. Still, she said, seeing her childhood sweetheart sail off on a war ship is quite different. Petty Officer 3rd Class Jason Charliaga sailed off aboard the Nimitz barely a month after proposing to his 19-year-old girlfriend, Sarah Howell. She also is a sailor but is staying home. This is the fourth time Petty Officer 1st Class Elmer Mojica, has left his wife, Mary Grace, and three children to go to sea. For some special quality time, the family recently took a trip to Disneyland. “It feels like it's getting tougher every time, but that's how it is in the Navy,” Mojica said. Already, many of the service members' families are hearing rumors the cruise will last longer than the planned six months. Everyone hopes the speculation isn't true.